A Band of Orcs came to your miserable Earth-Realm because some doomed nerd rolled “A Band of Orcs” on a random encounter table during a Role-Playing Game and inadvertently summoned the tusked savages through the Ohlone Vortex in Santa Cruz, CA. They promptly slaughtered the kids playing the game, but were entranced by the deliciously demonic and hellish sounds of Slayer’s “Raining Blood” coming from upstairs. There they found Jed jamming on his guitar, headbanging. Jed was spared, so long as he vowed to teach the WarChiefs the magic of Metal. Since that wyrd evening, A Band of Orcs have released the 2007 EP“WarChiefs of the Apocalypse” (Grimpire Entertainment), the 2012 Full-length concept album “Adding Heads to the Pile” (Itchy Metal Entertainment), and went on the 2013 Madness at the Core of Time Tour with Iron Reagan, White Chapel, and the mighty Gwar, in what fatefully turned out to be among the immortal St. Oderus Urungus’ last raids on Earth. May the Scumdog Ancestors receive him…Hail Gzoroth!!!! 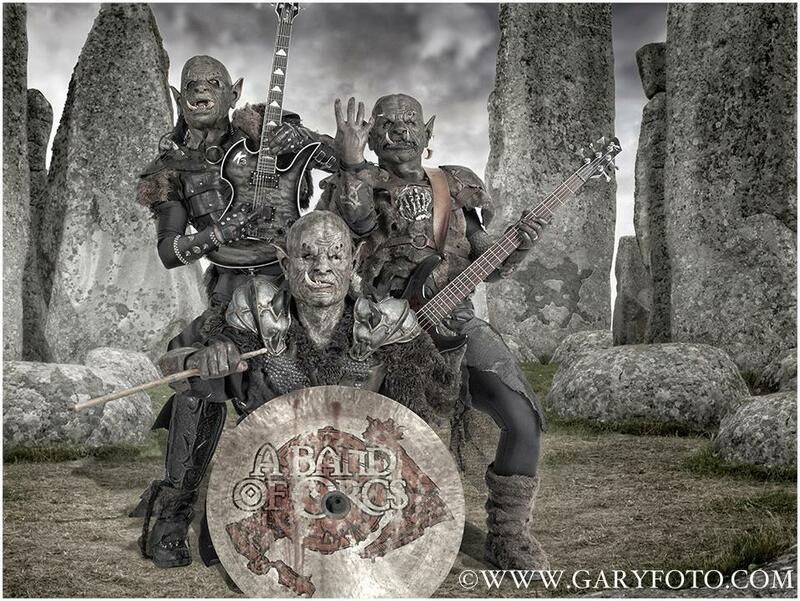 A Band of Orcs, formerly a 5-piece war machine, is now a 3-piece War Machine. Two WarChiefs have fallen in battle or left the Tribe – Hulg ElfR.I.P.per has met his final death after a series of zombie re-animations that always managed to go awry, while late leader and WarChief Gogog Bloodthroat had the misfortune of finding and embracing the Yellow Sign, which engulfed him in madness. Since then he has disappeared through a Wyrmhole back to the blasted wastes of Hirntodia where it is rumored he hunts ghosts and demons in eternal rage. Oog, Cretos, and Gronk! carry the Metal banner of the Gore-Stained Axe Tribe forward and return as a Death Metal Trio to the studio, wherein Cretos and Gronk! will share bardic vocal-telling roles; the songs have been written for one brutal guitar instead of two; and Oog lets loose with the Tribal war drum beat downs. Stay tuned for a rawer, more brutal form of tribal orc metal…Hail Gzoroth!! !